Having a Groundbreaking in Nebraska? Here's A Quick Guide! A groundbreaking ceremony is a big event by all standards. It's a landmark accomplishment and should be treated as such, and though it might not be clear at first what supplies you will need to organize a first rate event, if you're having a groundbreaking in Nebraska? Here's a quick guide from CeremonialSupplies.com. Aside from our high quality crafted groundbreaking shovels, hard hats and other products, we offer an essential guide customized for Nebraska! The state once called "The Great American Desert," and after J. Sterling Morton founded Arbor Day in Nebraska in 1872 it was called "Tree Planter's State," and in 1945 the nickname that stuck is the "Cornhusker State." Known for many things, including a lighthouse without an ocean in Ashland; a restaurant chain, Runza, exclusive only to Nebraska; and "Archie" the largest mammoth skeleton ever found, on a farm in Lincoln County in 1922 and now on display in the University of Nebraska State Museum, and the home of the "Wizard of Omaha," humble billionaire Warren Buffet. With so much to inspire a first ground cutting, it's easy to lose sight of what must be done first, and this means planning! We know you've heard it time and again but early planning is the key to a successful event. Envisioning the event in your heard is not enough. Put pen to paper and write down details. Start with dates. Some people use their city's local event calendar to make sure the date of the groundbreaking ceremony doesn't compete with other popular events. For example, the Lincoln, Nebraska Convention and Visitors Bureau has a pretty complete local calendar of events. Once you have settled on a date, next thing is create your guest list and create the invitation. Company VIPs, out of town guests, local government officials and media, (or national and international personalities, depending the reach of your event) are all guests you want to include. Tip: Obtaining a formal acceptance by a local government official, like Lincoln's mayor Chris Beutler, or a well-known celebrity or personality will guarantee the media's attendance to cover your event. Creating and maintaining a media list sounds archaic to young entrepreneurs but really, create one. You will communicate easier and more often when you have an actual list. Local community papers are important for your business. Make sure you include them in your list. Nebraska has a number of city papers that are also distributed statewide, like the Lincoln Journal Star, Fremont Tribune, the Nebraska City News-Press, Omaha World-Herald and Omaha Daily Bee, the Norfolk Daily News, the Columbus Telegram, Kearney Hub, McCook Gazette and Hastings Tribune, just to name the top ones. You've prepared a media list and have the invitations ready to mail. Here's another tip: Make phone calls. Don't fear the phone. Especially that Nebraska has a world-wide reputation for epitomizing the humble soul of the people from America's prairies and plains. Guests are more likely to respond to an invitation when they are contacted personally prior to receiving the invite. Use online tools like Eventbrite.com and other similar platforms where you can engage and keep track of guests and use feedback and comments to stir interest in your groundbreaking event. Get Your Ceremonial Supplies On Time! We can't repeat enough how much time and money you will save with early ordering, not to mention stress and anxiety! Especially if you want your groundbreaking shovels and the ceremonial hard hats customized with a logo or text, or personalized ribbons and presentation plaques. Yes, we have been known to perform miracles "need it by yesterday" turn around, but we prefer to rely on your good planning instead. Remember the customization process can take 2 or 3 days depending on the quantity being ordered. The rule of thumb is to give yourself at least 2 weeks prior to the event to get groundbreaking shovels customized, especially if you will need a quantity of 15 or 20 logo customized shovels. Also, if you're ordering a personalized ribbon spool of 50 yards, or 100 customized ceremonial hard hats (which are manufactured to construction industry standards), or a step and repeat banner, keep in mind our printing process is so awesome because it's labor intensive and handled with professional care. 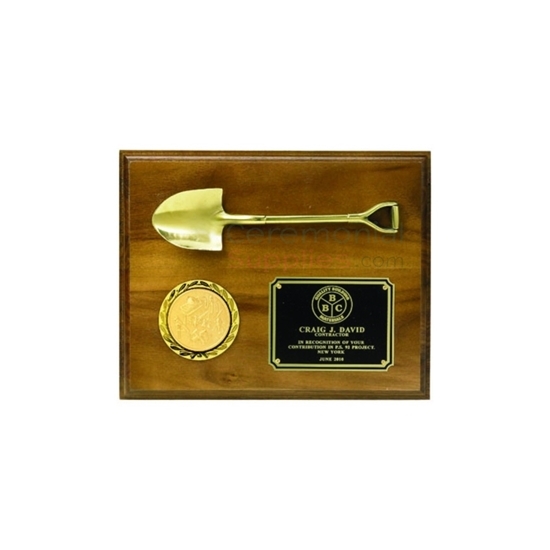 Choosing the ceremonial groundbreaking shovel (or shovels, depending on the number of people who will be involved in the ceremony) is one of the first supplies to order. If a large group is expected to take part in the cutting of ground, you may want to opt for the standard, stainless steel, polished chrome style ceremonial shovel, and maybe one or two VIP mirror chromed sod-cutting shovels if principals of the company will want to preserve and display them. The most important thing is to give yourself plenty of time to order. Not sure about the timing? Give us a call 1-877-373-4273 or contact us here for details. You have a confirmed list of prominent guests, the mayor will be present and will give a dedication speech, the food and refreshments have been ordered, and the tent will be delivered at the groundbreaking location the day of the event. A popular idea for decorating the tent inside is to drape wide ribbons outward from the center of the tent and have them hang down the sides. The ribbons should reflect the company or logo colors. An additional touch that serves as keepsake and decoration is to personalize smaller size ribbons with the name of the event and the date and use these to dress up the tables. It's a good idea to designate an area for official photographs and to do this as people first walk in to avoid bottlenecking and allow a constant flow of people into the event. A step and repeat banner with your company logo and that of any affiliates will give the event residual promotional momentum, especially if there will be media present. Everyone loves to feel like a star and standing on a red carpet aisle runner in front of the step and repeat banner, with stanchions and rope guiding the way to the photo area will surely do it! CeremonialSupplies.com is proud to carry a selection of plush, luxurious, event carpet runners in the traditional crimson red, in blue, green aisle runner, regal purple, elegant black, and femininely empowered pink aisle carpet. Combine the best color to go with your logo or theme. The ceremonial shovels are the big stars of the event, and having them fully dressed with matching hard hat and bow on their individual shovel display stands will create another photo opportunity for the VIPs and guests, and the stands come in handy for placing the shovels after the sod-cutting ceremony. 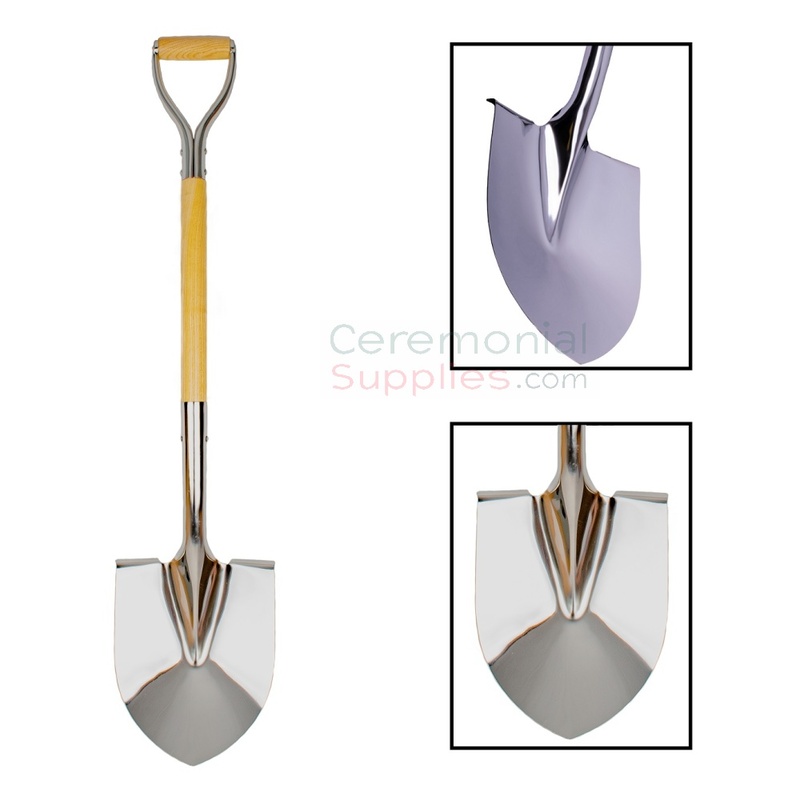 All the ceremonial shovels carried by CeremonialSupplies.com are full size, 42" tall with a 9.5" blade, made of stainless steel that will not rust or stain and the styles range from Standard, polished chrome and wood handle to the Deluxe, polished chrome with wood and metal handle, VIP mirror polished blade with wood and steel handle, the traditional long stem with polished chrome, and a fun selection of colorful ceremonial shovels in blue, green, pink, red, yellow, and orange, and we also offer groundbreaking kids shovels in mini size 26" tall and a 6" blade, for children taking part in the sod-cutting ceremony. All our groundbreaking shovels can be customized with a logo or text on the blade, the stem, the handle, or all three. Wherever you are in the farmland of America, from Harrison, to Norfolk, Fremont, Omaha, Lincoln, or tiny Monowi, CeremonialSupplies.com has the groundbreaking shovels, and all the supplies you need for your groundbreaking ceremony, and we ship promptly and efficiently to Nebraska, and everywhere else in the world. Click here to request a shipping quote.